Every Oracle Database reads or write data on disk, the database generates disk I/O. The performance of many software applications is inherently limited by disk I/O. Applications that spend the majority of CPU time waiting for I/O activity to complete are said to be I/O-bound. Oracle Database is designed so that if an application is well written, its performance should not be limited by I/O. Tuning I/O can enhance the performance of the application if the I/O system is operating at or near capacity and is not able to service the I/O requests within an acceptable time. However, tuning I/O cannot help performance if the application is not I/O-bound (for example, when CPU is the limiting factor). Many I/O designs plan for storage and availability requirements with the assumption that performance will not be an issue. This is not always the case. Optimally, the number of disks and controllers to be configured should be determined by I/O throughput and redundancy requirements. The size of disks can then be determined by the storage requirements. When developing an I/O design plan, consider using Oracle Automatic Storage Management (Oracle ASM). Oracle ASM is an integrated, high-performance database file system and disk manager that is based on the principle that the database should manage storage instead of requiring an administrator to do it. The maximum I/O size for full table scans is computed by multiplying this parameter with DB_BLOCK_SIZE. (the upper value is subject to operating system limits). If this value is not set explicitly (or is set to 0), the default value corresponds to the maximum I/O size that can be efficiently performed and is platform-dependent. On low-concurrency (sequential) systems, ensure that no single I/O visits the same disk twice. For example, assume that the stripe width is four disks, and the stripe depth is 32K. If a single 1MB I/O request (for example, for a full table scan) is issued by an Oracle server process, then each disk in the stripe must perform eight I/Os to return the requested data. To avoid this situation, the size of the average I/O should be smaller than the stripe width multiplied by the stripe depth. If this is not the case, then a single I/O request made by Oracle Database to the operating system results in multiple physical I/O requests to the same disk. On high-concurrency (random) systems, ensure that no single I/O request is broken up into multiple physical I/O calls. Failing to do this multiplies the number of physical I/O requests performed in your system, which in turn can severely degrade the I/O response times. Coarse grain striping allows a disk in the array to service several I/O requests. In this way, a large number of concurrent I/O requests can be serviced by a set of striped disks with minimal I/O setup costs. Coarse grain striping strives to maximize overall I/O throughput. Multiblock reads, as in full table scans, will benefit when stripe depths are large and can be serviced from one drive. Parallel query in a data warehouse environment is also a candidate for coarse grain striping because many individual processes each issue separate I/Os. If coarse grain striping is used in systems that do not have high concurrent requests, then hot spots could result. On some Oracle Database ports, a database block boundary may not align with the stripe. If your stripe depth is the same size as the database block, then a single I/O issued by Oracle Database may result in two physical I/O operations. This is not optimal in an OLTP environment. To ensure a higher probability of one logical I/O resulting in no more than one physical I/O, the minimum stripe depth should be at least twice the Oracle block size. Table 17-2 shows recommended minimum stripe depth for random access and for sequential reads. If your LVM cannot support dynamically adding disks to the stripe, then it is likely that you need to choose a smaller, more manageable stripe width. Then, when new disks are added, the system can grow by a stripe width. One popular approach to manual I/O distribution suggests separating a frequently used table from its index. This is not correct. During the course of a transaction, the index is read first, and then the table is read. Because these I/Os occur sequentially, the table and index can be stored on the same disk without contention. It is not sufficient to separate a data file simply because the data file contains indexes or table data. The decision to segregate a file should be made only when the I/O rate for that file affects database performance. If the files with high I/O are data files belonging to tablespaces that contain tables and indexes, then identify whether the I/O for those files can be reduced by tuning SQL or application code. If the files with high-I/O are data files that belong to the TEMP tablespace, then investigate whether to tune the SQL statements performing disk sorts to avoid this activity, or to tune the sorting. Figure 17-1 illustrates how redo members should be distributed across disks to minimize contention. Description of "Figure 17-1 Distributing Redo Members Across Disks"
Mirroring redo log files, or maintaining multiple copies of each redo log file on separate disks, does not slow LGWR considerably. LGWR writes to each disk in parallel and waits until each part of the parallel write is complete. Thus, a parallel write does not take longer than the longest possible single-disk write. When file systems can contain all Oracle Database data, database administration is simplified by using Oracle Managed Files. Oracle Database internally uses standard file system interfaces to create and delete files as needed for tablespaces, temp files, online logs, and control files. Administrators only specify the file system directory to be used for a particular type of file. You can specify one default location for data files and up to five multiplexed locations for the control and online redo log files. Oracle Database ensures that a unique file is created and then deleted when it is no longer needed. This reduces corruption caused by administrators specifying the wrong file, reduces wasted disk space consumed by obsolete files, and simplifies creation of test and development databases. It also makes development of portable third-party tools easier, because it eliminates the need to put operating system-specific file names in SQL scripts. New files can be created as Oracle Managed Files, while old ones are administered in the old way. Thus, a database can have a mixture of Oracle Managed Files and user-managed files. Oracle Managed Files cannot be used with raw devices. Because Oracle Managed Files require the use of a file system, DBAs give up control over how the data is laid out. Therefore, it is important to correctly configure the file system. Build the file system for Oracle Managed Files on top of an LVM that supports striping. For load balancing and improved throughput, stripe the disks in the file system. Oracle Managed Files work best if used on an LVM that supports dynamically extensible logical volumes. Otherwise, configure the logical volumes as large as possible. Oracle Managed Files work best if the file system provides large extensible files. The use of multiple block sizes in a single database instance is not encouraged because of manageability issues. If the rows are large, such as rows containing large object (LOB) data, then choose a larger block size. Table 17-3 lists the advantages and disadvantages of different block sizes. Permits reading several rows into the buffer cache with a single I/O (depending on row size and block size). The I/O calibration feature of Oracle Database enables you to assess the performance of the storage subsystem, and determine whether I/O performance problems are caused by the database or the storage subsystem. Unlike other external I/O calibration tools that issue I/Os sequentially, the I/O calibration feature of Oracle Database issues I/Os randomly using Oracle data files to access the storage media, producing results that more closely match the actual performance of the database. Oracle Database also provides Orion, an I/O calibration tool. Orion is a tool for predicting the performance of an Oracle database without having to install Oracle or create a database. Unlike other I/O calibration tools, Oracle Orion is expressly designed for simulating Oracle database I/O workloads using the same I/O software stack as Oracle. Orion can also simulate the effect of striping performed by Oracle Automatic Storage Management. For more information, see "I/O Calibration with the Oracle Orion Calibration Tool". When using file systems, asynchronous I/O can be enabled by setting the FILESYSTEMIO_OPTIONS initialization parameter to SETALL. Additionally, only one calibration can be performed on a database instance at a time. The I/O calibration feature of Oracle Database is accessed using the DBMS_RESOURCE_MANAGER.CALIBRATE_IO procedure. This procedure issues an I/O intensive read-only workload, made up of one megabyte of random of I/Os, to the database files to determine the maximum IOPS (I/O requests per second) and MBPS (megabytes of I/O per second) that can be sustained by the storage subsystem. In the first step of I/O calibration with the DBMS_RESOURCE_MANAGER.CALIBRATE_IO procedure, the procedure issues random database-block-sized reads, by default, 8 KB, to all data files from all database instances. This step provides the maximum IOPS, in the output parameter max_iops, that the database can sustain. The value max_iops is an important metric for OLTP databases. The output parameter actual_latency provides the average latency for this workload. When you need a specific target latency, you can specify the target latency with the input parameter max_latency (specifies the maximum tolerable latency in milliseconds for database-block-sized IO requests). The second step of calibration using the DBMS_RESOURCE_MANAGER.CALIBRATE_IO procedure issues random, 1 MB reads to all data files from all database instances. The second step yields the output parameter max_mbps, which specifies the maximum MBPS of I/O that the database can sustain. This step provides an important metric for data warehouses. The calibration runs more efficiently if the user provides the num_physical_disks input parameter, which specifies the approximate number of physical disks in the database storage system. Due to the overhead from running the I/O workload, I/O calibration should only be performed when the database is idle, or during off-peak hours, to minimize the impact of the I/O workload on the normal database workload. Only run one calibration at a time on databases that use the same storage subsystem. If you simultaneously run the calibration across separate databases that use the same storage subsystem, the calibration will fail. Quiesce the database to minimize I/O on the instance. For Oracle Real Application Clusters (Oracle RAC) configurations, ensure that all instances are opened to calibrate the storage subsystem across nodes. For an Oracle Real Application Clusters (Oracle RAC) database, the workload is simultaneously generated from all instances. The num_physical_disks input parameter is optional. By setting the num_physical_disks parameter to the approximate number of physical disks in the database's storage system, the calibration can be faster and more accurate. In some cases, asynchronous I/O is permitted for data files, but the I/O subsystem for submitting asynchronous I/O may be maximized, and I/O calibration cannot continue. In such cases, refer to the port-specific documentation for information about checking the maximum limit for asynchronous I/O on the system. At any time during the I/O calibration process, you can query the calibration status in the V$IO_CALIBRATION_STATUS view. After I/O calibration is successfully completed, you can view the results in the DBA_RSRC_IO_CALIBRATE table. Oracle Orion is a tool for predicting the performance of an Oracle database without having to install Oracle or create a database. Unlike other I/O calibration tools, Oracle Orion is expressly designed for simulating Oracle database I/O workloads using the same I/O software stack as Oracle. Orion can also simulate the effect of striping performed by Oracle Automatic Storage Management. Table 17-4 lists the types of I/O workloads that Orion supports. For each type of workload shown in Table 17-4, Orion can run tests using different I/O loads to measure performance metrics such as MBPS, IOPS, and I/O latency. Load is expressed in terms of the number of outstanding asynchronous I/Os. Internally, for each such load level, the Orion software keeps issuing I/O requests as fast as they complete to maintain the I/O load at that level. For random workloads, using either large or small sized I/Os, the load level is the number of outstanding I/Os. For large sequential workloads, the load level is a combination of the number of sequential streams and the number of outstanding I/Os per stream. Testing a given workload at a range of load levels can help you understand how performance is affected by load. Run Orion when the storage is idle (or pretty close to idle). Orion calibrates the performance of the storage based on the I/O load it generates; Orion is not able to properly assess the performance if non-Orion I/O workloads run simultaneously. If a database has been created on the storage, the storage can alternatively be calibrated using the PL/SQL routine dbms_resource_manager.calibrate_io(). OLTP applications typically generate random reads and writes whose size is equivalent to the database block size, typically 8 KB. Such applications typically care about the throughput in I/Os Per Second (IOPS) and about the average latency (I/O turn-around time) per request. These parameters translate to the transaction rate and transaction turn-around time at the application layer. Orion simulates a random I/O workload with a given percentage of reads compared to writes, a given I/O size, and a given number of outstanding I/Os. In this Orion workload simulation, the I/Os are distributed across all disks. Data warehousing applications, data loads, backups, and restores generate sequential read and write streams composed of multiple outstanding 1 MB I/Os. Such applications are processing large amounts of data, such as a whole table or a whole database and they typically care about the overall data throughput in MegaBytes Per Second (MBPS). Orion can simulate a given number of sequential read or write streams of a given I/O size with a given number of outstanding I/Os. Orion can optionally simulate Oracle Automatic Storage Management striping when testing sequential streams. A sequential stream typically accesses the disks concurrently with other database traffic. With striping, a sequential stream is spread across many disks. Consequently, at the disk level, multiple sequential streams are seen as random 1 MB I/Os. Orion can simulate two simultaneous workloads: Small Random I/O and either Large Sequential I/O or Large Random I/O. This workload type enables you to simulate, for example, an OLTP workload of 8 KB random reads and writes with a backup workload of four sequential read streams of 1 MB I/Os. Each Orion data point is a test for a specific mix of small and large I/O loads sustained for a duration. An Orion test consists of multiple data point tests. These data point tests can be represented as a two-dimensional matrix. Each column in the matrix represents data point tests with the same small I/O load, but varying large I/O loads. Each row represents data point tests with the same large I/O load, but varying small I/O loads. An Orion test can be for a single point, a single row, a single column, or for the whole matrix. DAS (direct-attached) storage: You can use Orion to test the performance of one or more local disks, volumes, or files on the local host. SAN (storage-area network) storage: Orion can be run on any host that has all or parts of the SAN storage mapped as character devices. The devices can correspond to striped or un-striped volumes exported by the storage array(s), or individual disks, or one or more whole arrays. NAS (network-attached storage): You can use Orion to test the performance on data files on NAS storage. In general, the performance results on NAS storage are dependent on the I/O patterns with which the data files have been created and updated. Therefore, you should initialize the data files appropriately before running Orion. Oracle administrators can use Orion to evaluate and compare different storage arrays, based on the expected workloads. Oracle administrators can also use Orion to determine the optimal number of network connections, storage arrays, storage array controllers, and disks for the expected peak workloads. Select a test name to use with the Orion –testname parameter. This parameter specifies a unique identifier for your Orion run. For example, use the test name "mytest". For more information, see "Orion Parameters". Create an Orion input file, based on the test name. For example, create a file named mytest.lun. In the input file list the raw volumes or files to test. Add one volume name per line. Do not put comments or anything else in the .lun file. For more information, see "Orion Input Files". Depending on your platform, the file viewing utility you use and its interface may be different. Verify that your platform has the necessary libraries installed to do asynchronous I/Os. The Orion test is completely dependent on asynchronous I/O. On Linux and Solaris, the library libaio must be in the standard lib directories or accessible through the shell environment's library path variable (usually LD_LIBRARY_PATH or LIBPATH, depending on your shell). Windows has built-in asynchronous I/O libraries, so this issue does not apply. As a first test with Orion, use –run with either the oltp or dss option. If the database is primarily OLTP, then use –run oltp. If the database is primarily for data warehousing or analytics, then use –run dss. The I/O load levels generated by Orion take into account the number of disk spindles being tested (or specified with the –num_disks parameter). Keep in mind that the number of spindles may or may not be related to the number of volumes specified in the input file, depending on how these volumes are mapped. The section, "Orion Output Files" provides sample results showing the Orion output files. Using the sample file mytest_summary.txt is a good starting point for verifying the input parameters and analyzing the output. The sample files mytest_*.csv contain comma-delimited values for several I/O performance measures. For more information, see "Orion Output Files". When you specify the Orion –testname <testname> parameter, this sets the test name prefix for the Orion input and output filenames. The default value for the –testname option is "orion". The Orion input file, <testname>.lun should contain a carriage-return-separated list of LUNs. Use the Orion command parameters to specify the I/O workload type and to specify other Orion options. The –run parameter is required with the Orion command. Table 17-5 describes the –run parameter. Specifies the test run level to be level. This option provides the run level and allows complex commands to be specified at the advanced level. If not set as –run advanced, then setting any other parameter, besides –cache_size or –verbose, results in an error. Except advanced, all of the –run level settings use a pre-specified set of parameters. Tests with random small (8K) I/Os at increasing loads to determine the maximum IOPS. Tests with random large (1M) I/Os at increasing loads to determine the maximum throughput. Generates the Small Random I/O and the Large Random I/O workloads for a range of load levels. In this option, small and large I/Os are tested in isolation. The only optional parameters that can be specified at this run level are –cache_size and –verbose. Same as simple, but also generates combinations of the small random I/O and large random I/O workloads for a range of loads. The only optional parameters that can be specified at this run level are –cache_size and –verbose. Tests the workload you specify with optional parameters. Any of the optional parameters can be specified at this run level. Size of the storage array's read or write cache (in MB). For Large Sequential I/O workloads, Orion warms the cache by doing random large I/Os before each data point. Orion uses the cache size to determine the duration for this cache warming operation. If set to 0, do not perform cache warming. Unless this option is set to 0, Orion issues several unmeasured, random I/Os before each large sequential data point. These I/Os fill up the storage array's cache, if any, with random data so that I/Os from one data point do not result in cache hits for the next data point. Read tests are preceded with junk reads and write tests are preceded with junk writes. If specified, this 'cache warming' is performed until num MBs of I/O have been read or written. If not specified, warming occurs for a default amount of time (two minutes). That is, issue two minutes of unmeasured random I/Os before each data point. Set the duration to test each data point in seconds to the value num_seconds. Prints Orion help information. All other options are ignored with help set. Type of mixed workloads to test over a range of loads. An Orion test consists of multiple data point tests. The data point tests can be represented as a two-dimensional matrix. basic: No mixed workload. The Small Random and Large Random/Sequential workloads are tested separately. Test small I/Os only, then large I/Os only. detailed: Small Random and Large Random/Sequential workloads are tested in combination. Test entire matrix. point: A single data point with S outstanding Small Random I/Os and L outstanding Large Random I/Os or sequential streams. S is set by the –num_small parameter. L is set by the –num_large parameter. Test with –num_small small I/Os, –num_large large I/Os. col: Large Random/Sequential workloads only. Test a varying large I/O load with –num_small small I/Os. row: Small Random workloads only. Test a varying small I/O load with –num_large large I/Os. max: Same as detailed, but only tests the workload at the maximum load, specified by the –num_small and –num_large parameters. Test varying loads up to the –num_small and –num_large limits. Specify the number of physical disks used by the test. Used to generate a range for the load. Specifies the number of disks (physical spindles). This number value is used to gauge the range of loads that Orion should test at. Increasing this parameter results in Orion using heavier I/O loads. Default Value: the number of LUNs in <testname>.lun. Controls the large I/O load. Note, this option only applies when –matrix is specified as: row, point, or max. When the –type option is set to rand, the parameter argument value specifies the number of outstanding large I/Os. When the –type option is set to seq, the parameter argument value specifies the number of sequential I/O streams. Specify the maximum number of outstanding I/Os for the Small Random I/O workload. Note: this only applies when –matrix is specified as col, point, or max. Specify the number of concurrent I/Os per stream as num. Note: this parameter is only used if –type is seq. concat: A virtual volume is simulated by serially chaining the specified LUNs. A sequential test over this virtual volume will go from some point to the end of each one LUN, followed by the beginning to end of the next LUN, and so on. raid0: A virtual volume is simulated by striping across the specified LUNs. Each sequential stream issues I/Os across all LUNs using raid0 striping. The stripe depth is 1M by default, to match the Oracle Automatic Storage Management stripe depth, and can be changed with the –stripe parameter. The LUNs are concatenated into a single virtual LUN (VLUN) and random offsets are chosen within the VLUN. With striping (–simulate raid0). The LUNs are used to create a single striped VLUN. With no concurrent Small Random workload, the sequential streams start at fixed offsets within the striped VLUN. For n streams, stream i start at offset VLUNsize * (i + 1) / (n + 1), unless n is 1, in which case the single stream start at offset 0. With a concurrent Small Random workload, streams start at random offsets within the striped VLUN. Without striping (–simulate CONCAT). The LUNs are concatenated into a single VLUN. The streams start at random offsets within the single VLUN. This parameter is typically only used if –type is seq. Specify the num, size of the I/Os (in KB) for the Large Random or Sequential I/O workload. Specify the num, size of the I/Os (in KB) for the Small Random I/O workload. API to use for testing I/O workload. skgfr: Use operating system I/O layer. oss: Use OSS API for I/O with Cell server in an Exadata machine. asmlib: Use ASMLIB disk devices based storage API for I/O. odmlib: Use Direct NFS storage based API for I/O. Specify the tname identifier for the test run. When specified, the input file containing the LUN disk or file names must be named <tname>.lun. The output files are named with the prefix <tname>_. Type of the Large I/O workload. rand: Randomly distributed large I/Os. seq: Sequential streams of large I/Os. Prints status and tracing information to standard output. Specify the percentage of I/Os that are writes to num_write; the rest being reads. This parameter applies to both the Large and Small I/O workloads. For Large Sequential I/Os, each stream is either read-only or write-only; the parameter specifies the percentage of streams that are write-only. The data written to disk is garbage and unrelated to any existing data on the disk. Caution: write tests obliterate all data on the specified LUNS. Write tests obliterate all data on the specified LUNS. The output files for a test run are prefixed by <testname>_<date> where date is yyyymmdd_hhmm. Table 17-7 lists the Orion output files. Performance results of small I/Os in IOPS. Latency of small I/Os in microseconds. Performance results of large I/Os in MBPS. Summary of the input parameters, along with the minimum small I/O latency (in secs), the maximum MBPS, and the maximum IOPS observed. If you are performing write tests, be prepared to lose any data stored on the LUNs. mytest_mbps.csv: comma-delimited value file containing the data transfer rate (MBPS) results for the Large Random/Sequential workload. In the general case, this and all other CSV files contains a two-dimensional table. Each row in the table corresponds to a large I/O load level and each column corresponds to a specific small I/O load level. Thus, the column headings are the number of outstanding small I/Os and the row headings are the number of outstanding large I/Os (for random large I/O tests) or the number of sequential streams (for sequential large I/O tests). The following example shows the first few data points of the Orion MBPS output CSV file for "mytest". The simple mytest command-line does not test combinations of large and small I/Os. Hence, the MBPS file has just one column corresponding to 0 outstanding small I/Os. In this example, at a load level of 8 outstanding large reads and no small I/Os, the report data indicates a throughput of 103.06 MBPS.
. .   . . . Figure 17-2 shows a sample data transfer rate measured at different large I/O load levels. This chart can be generated by loading mytest_mbps.csv into a spreadsheet and graphing the data points. Orion does not directly generate such graphs. The x-axis corresponds to the number of outstanding large reads and the y-axis corresponds to the throughput observed. 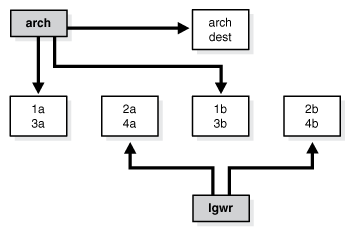 The graph shown in Figure 17-2 shows typical storage system behavior. As the number of outstanding I/O requests is increased, the throughput increases. However, at a certain point the throughput level stabilizes, indicating the storage system's maximum throughput value. Description of "Figure 17-2 Sample I/O Load Levels"
mytest_iops.csv: Comma-delimited value file containing the I/O throughput (in IOPS) results for the Small Random workload. Like in the MBPS file, the column headings are the number of outstanding small I/Os and the row headings are the number of outstanding large I/Os, when testing large random, or the number of sequential streams (for large sequential). In the general case, a CSV file contains a two-dimensional table. However, for a simple test where you are not testing combinations of large and small I/Os the results file has just one row. Hence, the IOPS results file just has one row with 0 large I/Os. As shown in the following example, data point with 12 outstanding small reads and no large I/Os provides a sample throughput of 951 IOPS. Large/Small,     1,     2,     3,     6,     9,    12 . . . .
0,             105,   208,   309,   569,   782,   951 . . . . The graph shown in Figure 17-3, generated by loading mytest_iops.csv into Excel and charting the data, illustrates the IOPS throughput seen at different small I/O load levels. Figure 17-3 shows typical storage system behavior. As the number of outstanding I/O requests is increased, the throughput increases. However, at a certain point, the throughput level stabilizes, indicating the storage system reaches a maximum throughput value. At higher throughput levels, the latency for the I/O requests also increase significantly. Therefore, it is important to view this data with the latency data provided in the generated latency results in mytest_lat.csv. Description of "Figure 17-3 I/O Throughput at Different Small I/O Load Levels"
mytest_lat.csv: Comma-delimited value file containing the latency results for the Small Random workload. As with the MBPS and IOPS files, the column headings are the number of outstanding small I/Os and the row headings are the number of outstanding large I/Os (when testing large random I/Os) or the number of sequential streams. In the general case, a CSV file contains a two-dimensional table. However, for a simple test where you are not testing combinations of large and small I/Os the results file has just one row. Hence, the IOPS results file just has one row with 0 large I/Os. In the following example, at a sustained load level of 12 outstanding small reads and no large I/Os, the generated results show an I/O turn-around latency of 22.25 milliseconds. Large/Small, 1, 2, 3, 6, 9, 12 . . . .
0, 14.22, 14.69, 15.09, 16.98, 18.91, 21.25 . . . . The graph in Figure 17-4, generated by loading mytest_lat.csv into Excel and charting the data, illustrates the small I/O latency at different small I/O load levels for mytest. Description of "Figure 17-4 I/O Latency at Small I/O Load Levels"
mytest_trace.txt: Contains the extended, unprocessed test output. Orion reports errors that occur during a test on standard output. Verify that you can access the volume in the same mode as the test, read or write, using a file copy program such as dd. Verify that your host operating system version can do asynchronous I/O. On Linux and Solaris, the library libaio must be in the standard lib directories or accessible through the shell environment's library path variable (usually LD_LIBRARY_PATH or LIBPATH, depending on your shell). The file system must be properly mounted for Orion to run. Please consult your Oracle Installation Guide for directions (for example, the section, Appendix B "Using NAS Devices" in the Database Installation Guide for Linux x86). The mytest.lun file should contain one or more paths of existing files. Orion does not work on directories or mount points. The file has to be large enough for a meaningful test. The size of this file should represent the eventual expected size of your datafiles (say, after a few years of use). You may see poor performance doing asynchronous I/O over NFS on Linux (including 2.6 kernels). If you are doing read tests and the reads are hitting untouched blocks of the file that were not initialized or previously written, some smart NAS systems may "fake" the read by returning zeroed-out blocks. When this occurs, you see unexpectedly good performance. The workaround is to write all blocks, using a tool such as dd, before performing the read test. If you run Orion on Windows: Testing on raw partitions requires temporarily mapping the partitions to drive letters and specifying these drive letters in the test.lun file. If you run Orion 32-bit Linux/x86 binary on an x86_64 system: Please copy a 32-bit libaio.so file from a 32-bit computer running the same Linux version. You should use the -duration option (see the optional parameters section for more details) to specify a long duration (like 120 seconds or more) for each data point. Since Orion tries to keep all the spindles running at a particular load level, each data point requires a ramp-up time, which implies a longer duration for the test. Specify a longer -duration value. A duration of 2x the number of spindles seems to be a good rule of thumb. Depending on your disk technology, your platform may need more or less time. Linux/Solaris: See I/O error troubleshooting. NT-Only: Do not move/remove the Oracle libraries included in the distribution. These must be in the same directory as orion.exe. You may have a large read or write cache, or read and write cache somewhere between the Orion program and the disk spindles. Typically, the storage array controller has the biggest effect. Find out the size of this cache and use the -cache_size advanced option to specify it to Orion (see the optional parameters section for more details). The total size of your volumes may be really small compared to one or more caches along the way. Try to turn off the cache. This is needed if the other volumes sharing your storage show significant I/O activity in a production environment (and end up using large parts of the shared cache). The run time increases when -num_disks is high. Orion internally uses a linear formula to determine how long it takes to saturate the given number of disks. The -cache_size parameter affects the run time, even when it is not specified. Orion does cache warming for two minutes per data point by default. If you have turned off the cache, specify -cache_size 0. The run time increases when a long -duration value is specified, as expected.